Nitrogen deficiencies are probably one of the most commonly mis-diagnosed deficiencies. Many times growers think any yellow leaves means a nitrogen deficiency, and often nitrogen deficiencies get misdiagnosed as something else. This is a Nitrogen Deficiency! The lowest leaves are wilting and turning yellow. Overall the plant looks a little pale, which is another sign of a nitrogen deficiency. The main time to worry about a nitrogen deficiency is in the vegetative stage because it's essential to making new leaves. When plants are budding they don't need much nitrogen. If you've been providing your plants with any nutrients at all, it's unlikely they're experiencing a nitrogen deficiency as N is included with almost every single plant nutrient! If growing in good soil, your soil should have enough nitrogen to last your plant for the first few weeks of life, though a fast-growing plant will need extra nitrogen after the first month to get the best growth. In soilless mediums like coco or hydro you will provide nutrients that include nitrogen right from the beginning. 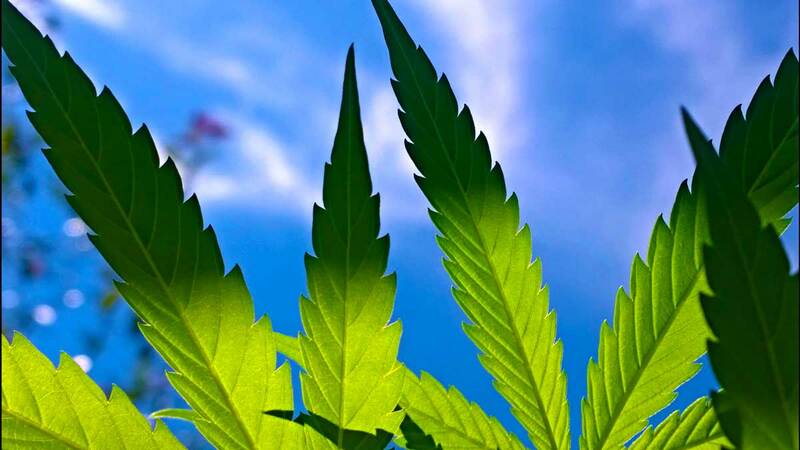 If a cannabis plant doesn't get enough Nitrogen, the lowest leaves will start dropping off as the plant "cannibalizes" them to power the growth of new leaves at the top! 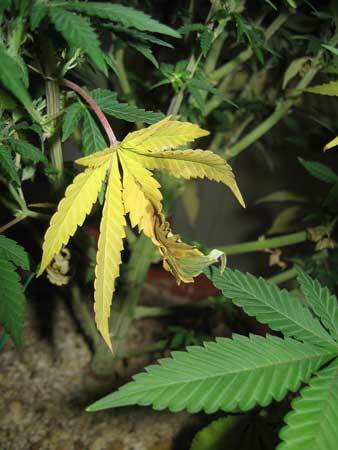 Yellow leaves drop off on their own with a nitrogen deficiency. 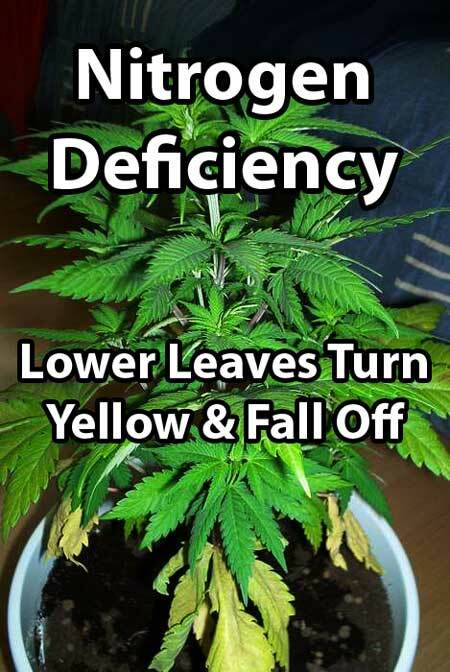 If yellow leaves from the bottom of the plant are difficult to pull off, and don't drop on their own, it means you likely have another type of nutrient deficiency that causes yellow leaves. Don't worry too much about yellow leaves on a flowering plant as it is getting close to harvest. 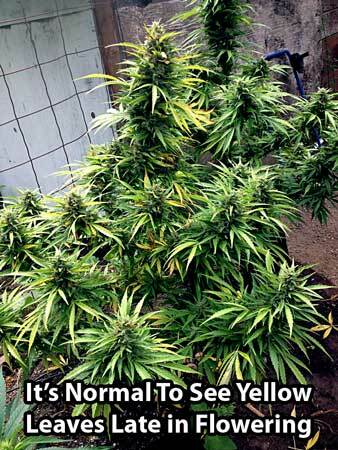 Some amount of yellowing is normal as buds mature and you don't want to overdo it. Too much nitrogen in the flowering stage can actually suppress bud growth! It's normal for every plant to lose some amount of yellow leaves at the bottom, especially if those leaves aren't getting light anymore. The time to worry is if the yellowing appears to be climbing up the plant! If it's just a few leaves here and there and the rest of the plant look green and healthy, don't worry about it! Get pictures of other nutrient deficiencies! 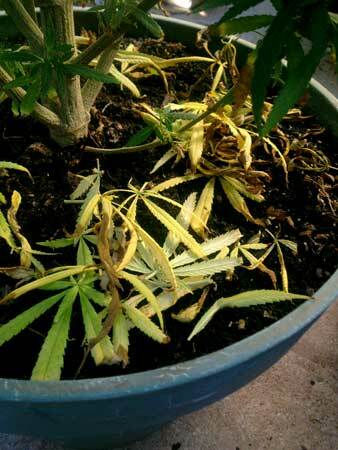 A nitrogen deficiency causes the lower/older leaves of a cannabis plant to start yellowing, wilting, and dropping off on their own. I feel like a lot of people will say any type of leaf yellowing is a nitrogen deficiency, but if it doesn't look like this than the yellow leaves are caused by something else. Cal-Mag deficiency is another one like that! Also the claw can be a result of over watering. A man believes what a man desires to be true. Very interesting I thought that it was caused by a nitrogen deficiency.